At the age of nine, Anjan did his debut performance at a conference in Calcutta in 1969 with the sensitive appraisal of the critics. As the days passed on, Anjan’s love for music grew more and more and he started feeling the cry of his heart for plunging into the deep vast ocean of Music. To know and to get the ideas of rhythmic part of Music he became disciple of the Tabla wizard Ustad Shaukat Ali Khan. 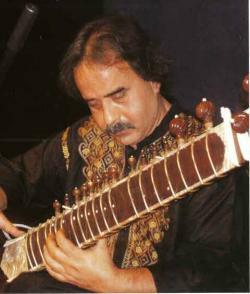 For advancement in the stream of Sitar Instrument he became a student of world famous Sitarist Surasree Kalyani Roy, one of the senior most students of Aftaab-e-Sitar Ustad Vilayat Hussain Khan, the trendsetter of modern days’ sitar playing. To grasp the serene and sublime mood of music, Anjan felt his sitar must sing like a vocalist. Therefore he started taking lessons in vocal music under the tutelage of Shree Muktipada Dutta, a representative of Agra gharana. That is the way Anjan reached the root of music for picking up the precious gems. Enormous and erudite talim made Anjan to set forth for becoming an artist who’s each bold stroke in hard strings could express excellence in each and every repertoire. Connoisseurs have been wonderstruck by his ability to balancing between technical verbosity and aesthetic gentility finely on the one hand and by his sense of symmetry and logic in musical efforts on the other.